A Feb. 29th occurs only once every six years. Bonus! How do you intend to spend this extra day? * OK, every four years. See comments. 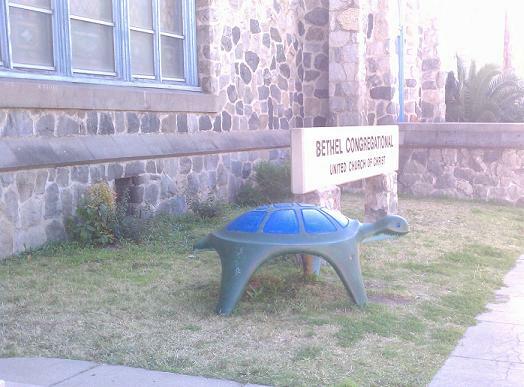 Reader Maria Tello, who contributes the above photo, is puzzled by the turtle outside Bethel Congregational United Church of Christ at Euclid Avenue and F Street in Ontario. “Is he a greeter? Perhaps reminding churchgoers that slow and steady wins the race? Maybe he draws in the younger crowd, looking to ride a tortoise?” she asks. Or draws in the older crowd who identifies with the tortoise, perhaps? Sunday’s column (read it here) sets out to document mentions of Cucamonga in Looney Tunes cartoons. Hey, if anyone was ever going to do that, I knew it had to be me. Above is a moment from “Raw! Raw! 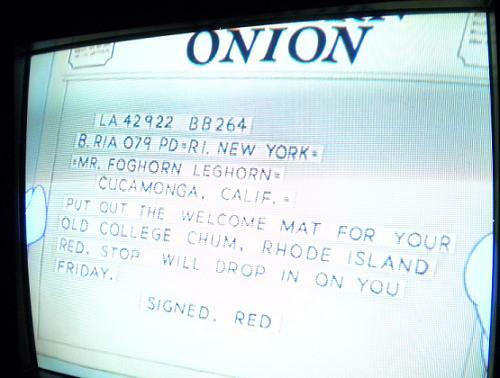 Rooster” (1956), a Western Onion telegram illustrating the little-known fact that one of the best-known Looney Tunes characters actually resided in Cucamonga. Is there a more famous celebrity with a Cucamonga connection? Move over, Jack Benny. Maybe the Victoria Gardens Cultural Center needs a statue of Foghorn Leghorn. Note: By April, the restaurant had changed hands and was now Royale Indian Cuisine. 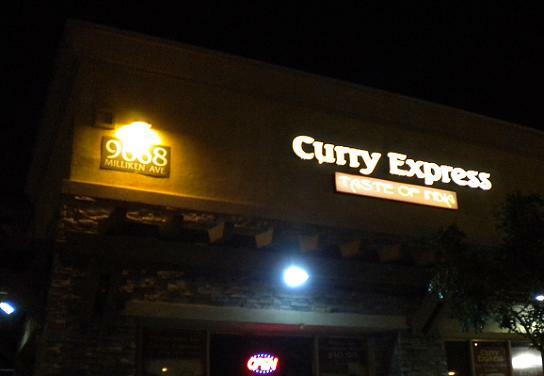 Curry Express opened in 2011 cater-corner from Ontario Mills in what I believe was previously a Hawaiian fast-food spot. I dropped in for dinner on a recent Tuesday. Despite the “express” name, this is a sitdown restaurant now, not fast food, although they do deliver. The interior has been redone with glass-topped tables, cloth napkins and high-backed booths. Yet it’s brightly lighted and not stuffy. Making the best of things, I had the chicken curry ($12), rice pellow ($6.50) and garlic naan ($3), and a glass of water. 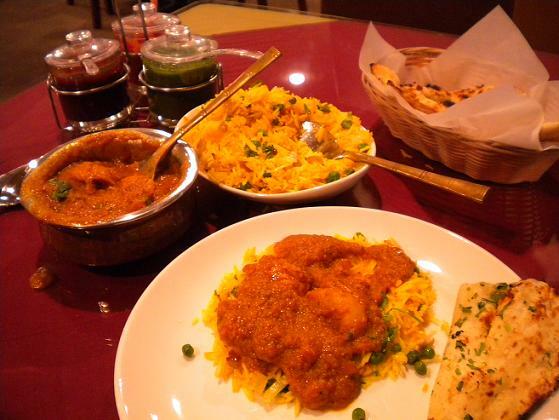 Like most Indian places, dinner made for a not-inexpensive meal (with tax and tip, $27), although I took home half. I guess that’s why so many people like Indian lunch buffets; Curry Express’ is $8. The curry was tasty, the naan thick and chewy. Six bucks is a lot to pay for a dish of rice, even if it does have onions, peas and nuts. Service was indifferent to friendly, depending on which of the two servers was near. The menu has tandoori specialties, chicken, lamb, goat and seafood dishes, and a fairly long list of vegetarian entrees, 19 in all. I preferred my subcontinent meals at Haandi and Koyla, both featured on this blog previously, but Curry Express is certainly acceptable, and vegetarians in particular might want to investigate it. Friday’s column (read it here) is about the Upland entry monuments that have sprouted around town. A blog post about the signs previously appeared here, from which some of the comments in the column were drawn. Now directing twice the traffic! 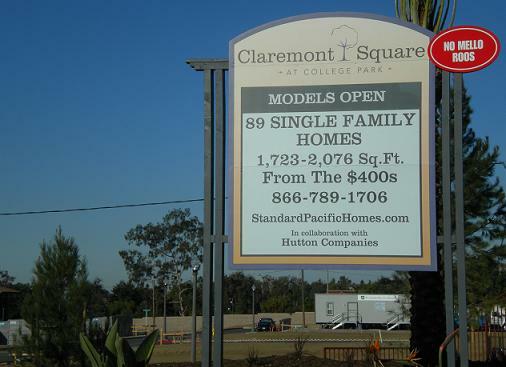 A few days after we mocked the two directional signs for the 10 Freeway seen a few feet apart on Foothill Boulevard east of Towne Avenue in Claremont, they were both replaced with a new dual sign directing motorists to both the 10 and 210 freeways. It’s double the information in half the number of signs — a nice upgrade. Haven’t noticed if they’ve since taken down the spare pole. 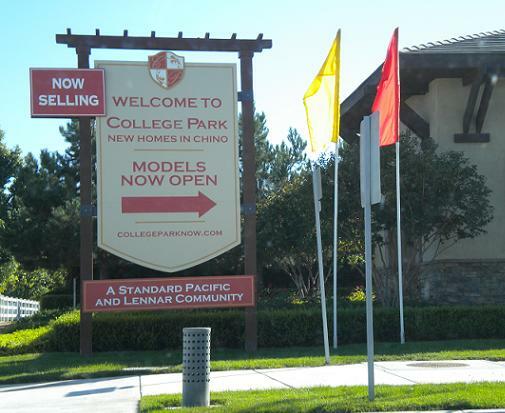 If you want to live in a development named College Park, you have your choice of Chino, above, and Upland, below. 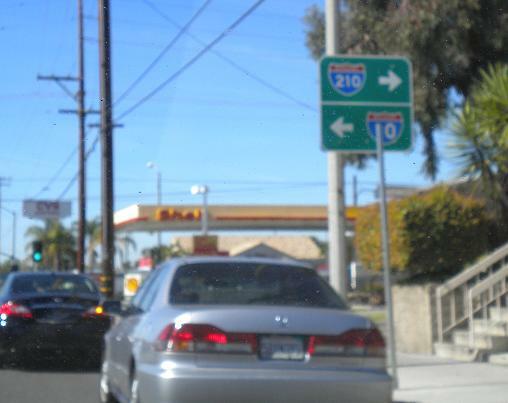 The former is near a Chaffey College campus while the latter is near the Claremont Colleges. Wednesday’s column (read it here) has items about an Ontario councilwoman who was wrapped her car with the city’s PR message and other items of note from around the valley. Jane Vath O’Connell of the whimsically named Alta Cucawanda Friends group forwarded the above image (click on it for a slightly larger view) and says it was done by member Marie Vecchio’s father in 1969 and depicts the Belcher Ranch. If I know them, they can. 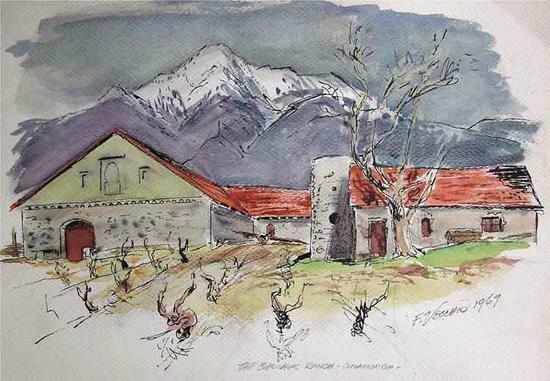 Incidentally, O’Connell says Alta Cucawanda Friends is up to 550 members, who share information and photos about the history of Rancho Cucamonga and environs. 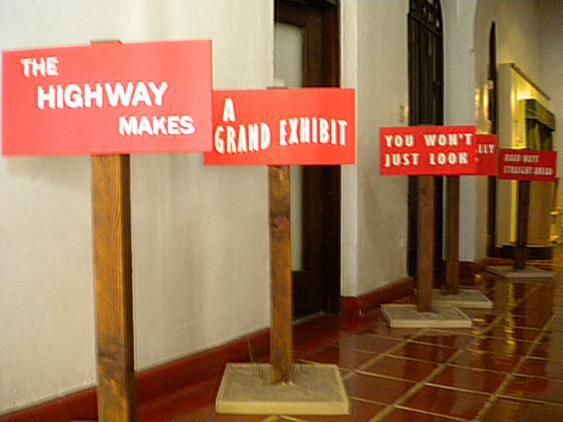 The exhibit is really cool, by the way, if you like 20th century Americana: early campsites, roadside art, neon signs, Route 66 and even a display about the legendary Ontario restaurant Ford Lunch.